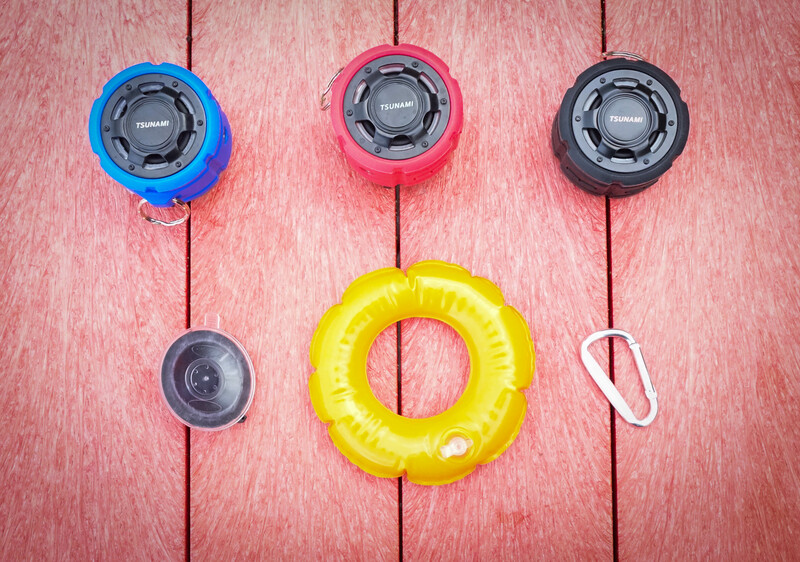 The TSUNAMI is a very unique speaker; it is not only a Bluetooth speaker but it’s also Waterproof. The TSUNAMI is rated IPX7 water resistant, and it will resist rainfall, water jets, and splashing, etc. It is perfect for the pool, hot tub, shower or the beach! The TSUNAMI (5 Watts) contains a large 50mm Speaker driver and passive subwoofer giving the TSUNAMI very loud and rich sound while providing the speaker with unbelievable bass response. Another incredible feature is the TSUNAMI’s built-in Microphone! Use the speaker as a portable speakerphone for incoming calls when connected wirelessly via Bluetooth. How to pair to your mobile device? 2. Activate Bluetooth on the phone or device you are pairing with. 3. If the speaker is already connected to other devices, press and hold the PLAY/ PAUSE button on your TSUNAMI speaker until the LED lights alternate between shining red and blue. You will hear the “pairing” sound. 4. Go to your phone or other devices’ Bluetooth settings and select TSUNAMI from the list. 5. If asked for a password, please enter “0000”. 6. Play music on your device and it will be heard through the speaker. The TSUNAMI comes with a rechargeable Lithium-ion battery; and will play for 3hrs @ full volume or 14 hrs at 30% volume. Before your first use, or when the battery runs out, please charge the TSUNAMI with the 3.5mm charging cable included in the package. Plug the small 3.5mm pin into the charging port on the back of the speaker and the other end of the cable (the standard USB 2.0 plug) into the USB port of a computer, or a USB main charger. The LED indicator light will turn red when it is being charged. When it is fully charged, the LED indicator light will go off. A full charge takes about 3.5 hours. The speaker can be charged while working. The battery of the speaker will be charged till the charging process completes. The speaker will be powered by the DC input directly and the battery will be in sleep mode after it is fully charged. To answer a call, press the TALK button and simply talk to the speaker. The built-in microphone will pick up your voice just like a phone. To end a call, press the TALK button again. To refuse a call, double press the TALK button. You can re-dial the last number called by double pressing the TALK button.